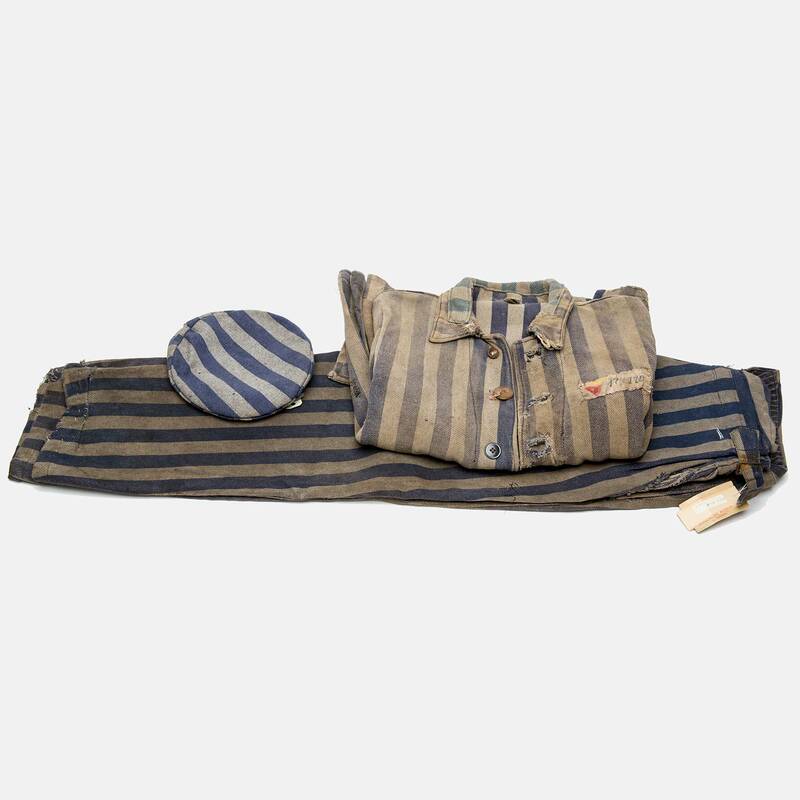 This prisoner's uniform from Auschwitz is a tragic reminder of the cruelty and inhumanity of the Nazi concentration camps, where prisoners who were not immediately murdered endured the most extreme suffering and humiliation. Auschwitz-Birkenau was the death site of approximately 1.1 million people. Located in southwest Poland, the complex was originally a Polish army base before the Nazis converted it into a concentration camp in April 1940 for the internment of German and Polish political prisoners. Due to its location and railway accessibility, Auschwitz became a death camp in 1942, as a part of the Nazi’s “Final Solution.” The complex ultimately became the most deadly of all the camps, with thousands killed daily in its gas chambers at the height of its operation. Countless others died of starvation, disease, and exhaustion from forced labor. In total, almost 1 million Jews, 75,000 non-Jewish Poles, 20,000 Roma, 15,000 Soviet prisoners of war, and thousands of others died there. 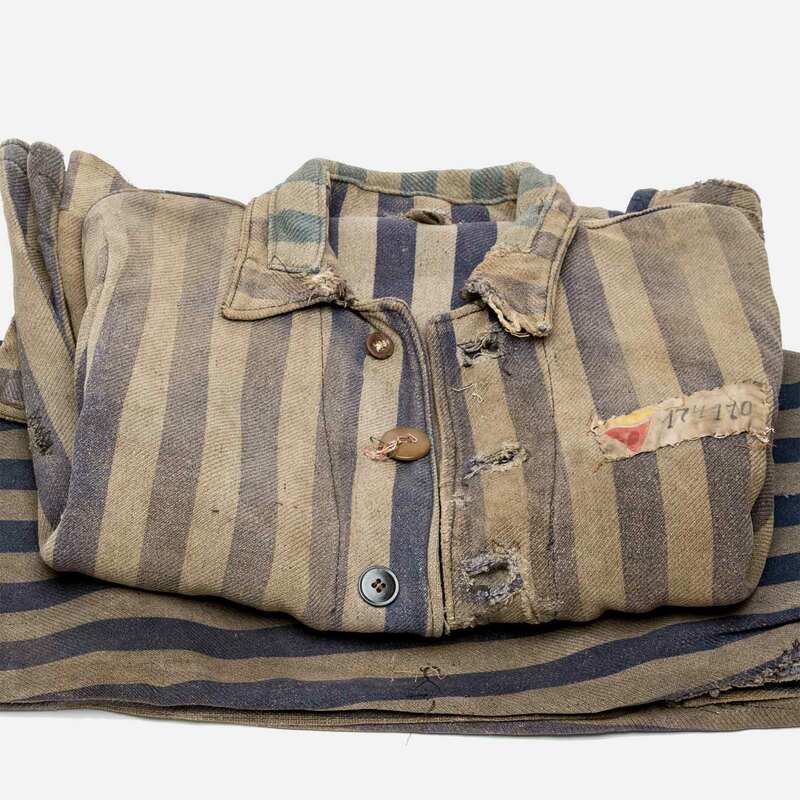 Auschwitz was evacuated in January 1945, as Soviet forces closed in and the Germans frantically sent the remaining prisoners on “death marches” to camps in Germany. Edith P. describes her experience in Auschwitz. Dimensions: 28 x 22 1/2 in.